From time to time, we'll select stories — old and new, sports and otherwise, relevant and merely sublime — that we urge you to read for one reason or another. 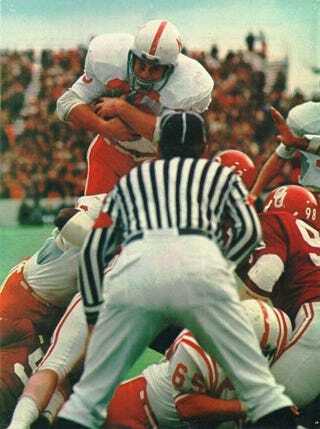 Today: Dan Jenkins on the 1971 Nebraska-Oklahoma "Game of the Century." In the land of the pickup truck and cream gravy for breakfast, down where the wind can blow through the walls of a diner and into the grieving lyrics of a country song on a jukebox—down there in dirt-kicking Big Eight territory—they played a football game on Thanksgiving Day that was mainly for the quarterbacks on the field and for self-styled gridiron intellectuals everywhere. The spectacle itself was for everybody, of course, for all of those who had been waiting weeks for Nebraska to meet Oklahoma, or for all the guys with their big stomachs and bigger Stetsons, and for all the luscious coeds who danced through the afternoons drinking daiquiris out of paper cups. But the game of chess that was played with bodies, that was strictly for the cerebral types who will keep playing it into the ages and wondering whether it was the greatest collegiate football battle ever. Under the agonizing conditions that existed, it well may have been. Quality is what the game had more of than anything else. There had been scads of games in the past with equal pressure and buildup. Games of the Decade or Poll Bowls or whatever you want to call them. Something played in a brimming-over stadium for limb, life and a national championship. But it is impossible to stir the pages of history and find one in which both teams performed so reputably for so long throughout the day. In essence, what won it for Nebraska was a pearl of a punt return in the game's first 3 1/2 minutes. Everything else balances out, more or less, even the precious few mistakes—Oklahoma's three fumbles against Nebraska's one, plus a costly Nebraska offside, the only penalty in the game. There was an unending fury of offense from both teams that simply overwhelmed the defenses, maniacal though they were. But that is the way it is with modern college football. You can't take away every weapon. Both Nebraska and Oklahoma stopped the things they feared most, but in so doing they gave up practically everything else. From Oklahoma's record-cracking Wishbone T the Cornhuskers removed the wide pitch to the halfback, mainly Greg Pruitt, but in doing so they relinquished the keep, the fullback into the middle and most of all the pass. To stop Pruitt, the Cornhuskers were forced to cover Wide Receiver Jon Harrison man for man, which they did ineffectually, thus allowing Harrison to catch four passes in critical situations, two for touchdowns. From Nebraska's imposing I spread and I slot Oklahoma took away the passing game but gave up the power running attack. So the two teams swapped touchdowns evenly from scrimmage, four for four, and Oklahoma added a field goal. But always there lingered the one thing they had not traded, that sudden, shocking, punt return by Nebraska's Johnny Rodgers. It was one of those insanely thrilling things in which a single player, seized by the moment, twists, whirls, slips, holds his balance and, sprinting, makes it all the way to the goal line. Rodgers went 72 yards for the touchdown, one which keeps growing larger in the minds of all. And afterward, back on the Nebraska bench, he did what most everybody in Norman, Okla. probably felt like doing: he threw up.